I just realized that I haven’t mentioned our little (litter?) 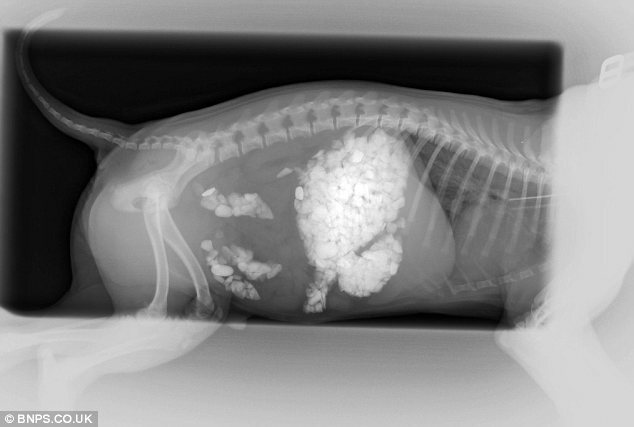 experiment – we litter box trained the puppies. Doing so was incredibly easy – easier than I’d imagined it could be, and I am unbelievably pleased with the results. We started from the minute that the pups were ready to move from their pool into their ex pen, which was right about when I started to wean them. That’s it! No fancy equipment or two hundred dollar indoor potty areas required, and our set up was clean smelling and easy to maintain. We set the ex pen up to be as small as possible for the first stage of training. 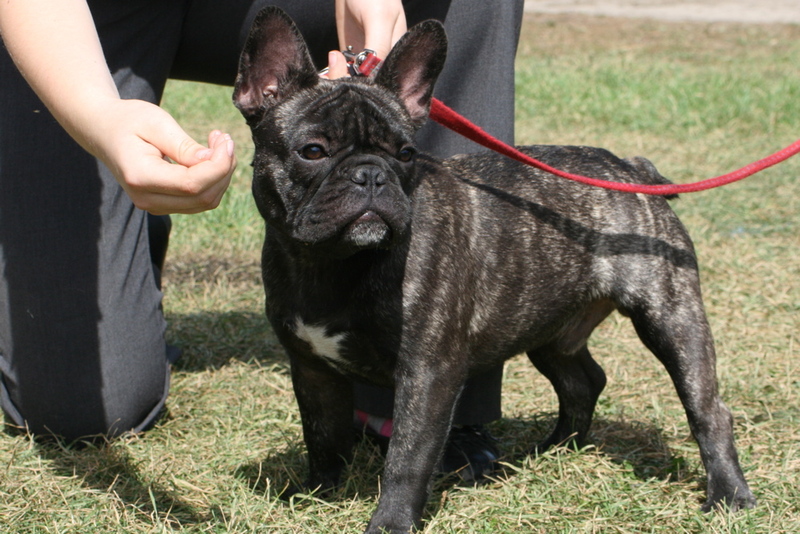 The puppies essentially had only two areas – a sleeping area, and their litter box. This forced the puppies to leave their bed when they wanted to eliminate, and left them with no choice but to use the litter box. We first placed the litter pan inside the ex pen with no door cut into it, but the side was too high for them to get over top of easily. Cutting a door into it, with still a lip underneath to contain the litter, solved that issue. Initially, we used wood shavings for litter. This was an unqualified disaster. 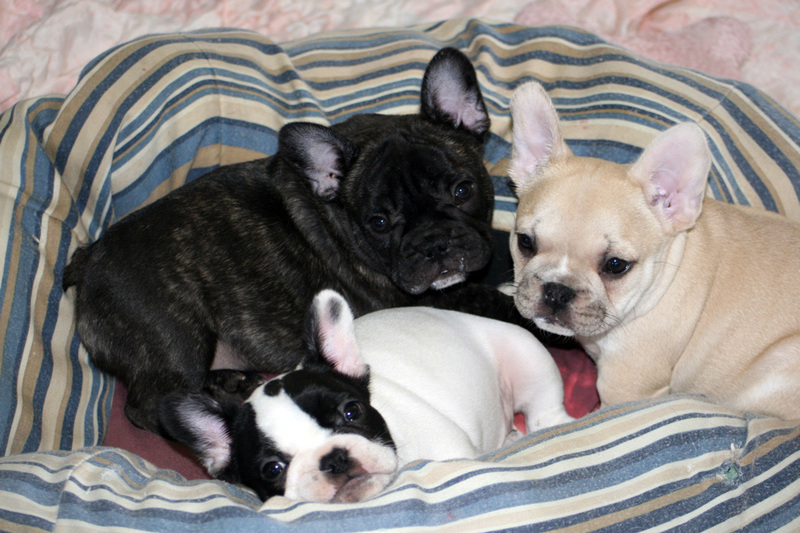 The shavings get everyplace – stuck in bedding, stuck on puppy paws, scattered on the floor, under the cushions of their bed. In fact, there were so many shaving stuck to their bedding that they clogged the sink in our laundry room. So much for that idea. Our next attempt was with pressed pine litter, which is what we use for our cat. Like the wood shavings, it smelled nice and clean, even when wet, but it also was messy. The pine pellets break down into sawdust when wet, and we ended up dealing with the same issues we had with shavings, in that the sawdust ended up everyplace. Our final product was compressed newspaper pellets, the same kind that veterinary clinics prescribe for cats who’ve had surgery, and for the same reason. It does not break down, even when wet, so it doesn’t track everyplace, and it doesn’t stick to bedding or to the puppies. It is neutral smelling, and the wet litter expands and darkens, making it easy to see the soiled litter when you go to clean out the box. Best of all, it’s easy to shake off of bedding, and can be swept up off of the floor without scattering everyplace. 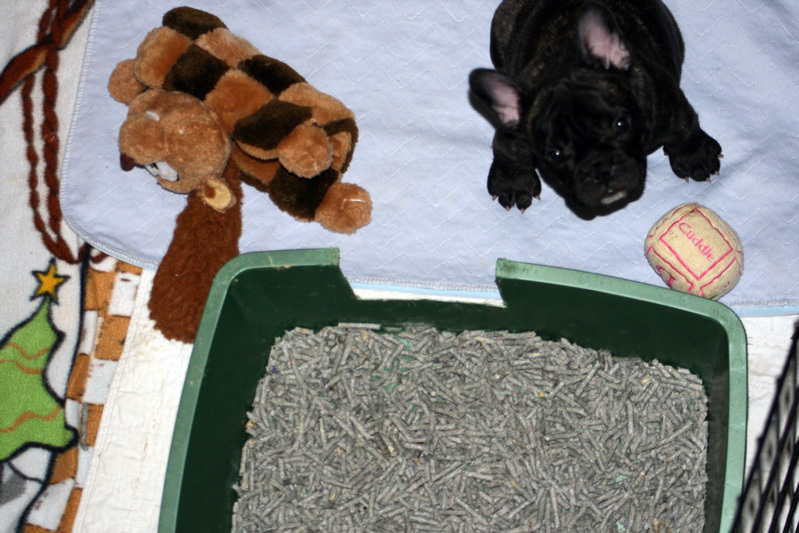 As the puppies matured, and began consistently using the litter box, we expanded the size of the ex pen. In our first expansion, we gave them a sleeping area, an area with their water dish and space for their food dish, and their litter box. 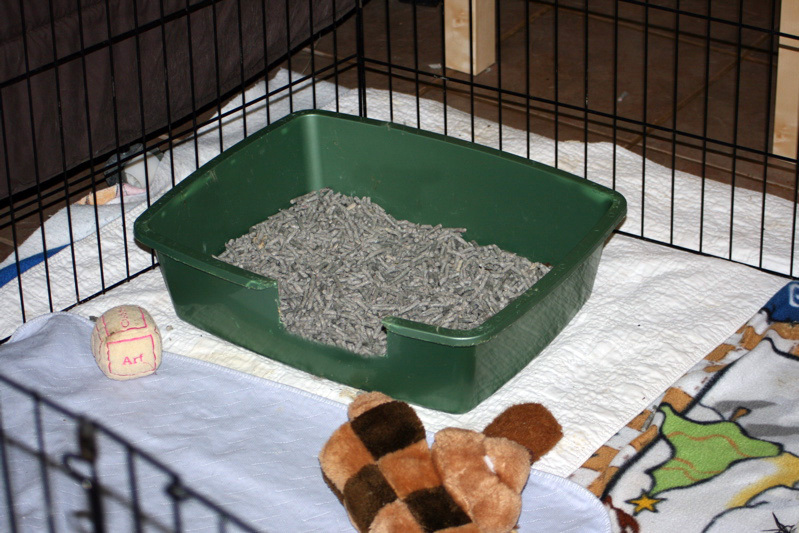 The litter box is placed on top of an absorbent puppy pad, to catch spills, poopy foot prints or the occasional ‘out of the box’ pee (the pups sometimes pee on the edge of the box, rather than inside it – sort of like human males, come to think of it). We use a second, smaller absorbent pad underneath the water dish, since there’s nothing puppies like more than splashing in their water. 8 weeks on, and the puppies’ ex pen is incredibly clean and tidy. When the pups have play time in the living room, I bring their litter box out with them. A few gentle pushes in the right direction, and they’ve all gotten into the habit of using it when they’re ready to eliminate. Other than the occasional lazy pee I mentioned above, I have never yet seen a mess outside of the litter box. Through the day, I scoop out any poop or soiled litter, and once every other day I clean the box out completely, sanitizing it with warm water and soap. Instead of the nightmare mess of dirty newspapers that used to greet me in the morning, I have a clean ex pen with a soiled litter box. The space is now full sized, with the litter box in one corner, and a large sleeping and play area taking up the rest of the pen. I’ve also added a small crate inside the pen, with the door removed, which the puppies can go in and out of as they wish. Teddy, who is now the only puppy here, likes sleeping inside his crate, and in a day or so I’ll add the door and see how that goes over. Simon and Alvin’s mom and dads have said that they might continue to use the litter box – Simon’s parents in particular, since they’re living in a condo right now. I’ll be interested to see if this early training pays off with puppies who are easier to housebreak. I always laughed at the idea of litter box trained dogs, but after this litter I’m no longer laughing. Instead, I’m an enthusiastic convert!